The official travel destination "Salzburg Umgebung" (Salzburg Surroundings) is something like a left-over. It comprises of those bits in the northern part of the province that are neither Salzburg city, nor properly Alpine, nor part of any lake area (otherwise they would belong to the Salzburger Seenland, which is sometimes included, or the Salzkammergut). The region of Salzburg Surroundings comprises of formerly agrarian villages that usually grew to a considerable size in the past 50 years. Most of them are typical commuter′s places and despite of being situated in a very scenic stretch of land, they offer little to the international tourist. In the light of this it might hit you as surprising to find many hotels in the Salzburg Surroundings. This is purely due to the vicinity to Salzburg City. Especially coaches and organised groups that spend only one or two days in Salzburg prefer to stay in hotels in the periphery or surroundings of the city, which are a great deal cheaper. The region itself advertises this advantage, alongside with good access to the Salzkammergut or Alpine regions in the south. Right in the surroundings themselves, you can go cycling or spend farm holidays; but don′t expect a particularly rural experience, the region is densely populated and strongly oriented towards the city. In summer, the Salzburg Festival is responsible for a large share of the guests. For many wealthy visitors of the festival it is good practice to spend the night and morning "on the countryside" and only the evenings with the performances and following dinners or parties in the city. This is also why many of Salzburg′s most exclusive gourmet restaurants can be found in the surroundings rather than in the city itself. Whilst public transportation between the villages and towns of the surroundings and the city of Salzburg is generally excellent, hotels might not be situated right at the station or bus stop. Keep that in mind when looking into the region. If you want to spend a lot of time in the city and don′t care about the surroundings at all, you might be better advised to look for hotels in the immediate neighbourhood of Salzburg. Villages further south in the Salzach River valley might be sub-ideal in that case. If you travel by car, that won′t apply. The outline of "Salzburg Surroundings" is somewhat fuzzy and less clearly defined as with most other travel destinations in Austria. There are the "official" members that formed an association and marketing platform; this platform comprises of towns and villages in the immediate surroundings of Salzburg, namely Anthering, Bergheim, Elsbethen, Eugendorf, Großgmain, Grödig, Hallwang, Wals-Siezenheim, Elixhausen, Anif. Other more vernacular measures also include Adnet, Bad Vigaun, Hallein, Krispl, Kuchl, Oberalm, Puch bei Hallein, St. Koloman and Koppl. 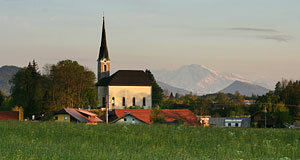 Even more generous definitions include all the villages in the north of the Flachgau area, the so-called Salzburger Seenland (Salzburg Lake District).